If you are seeking a spot with commanding views of the Spanish Mediterranean coastline then do take a look at this villa. You get views of the sea, sky, countryside and more. Not far from from Alicante and its airport, with Benidorm and Valencia within reachable distance, Benitachell lies in the province of Alicante, Costa Blanca. It is surrounded by many towns, such as Alfaz del Pi, Benissa, Calpe, Callosa de Ensarriá, Jalón and La Nucia. There are kilometers of glorious coastline with cliffs, alternating coves and beaches. The town of Benitachell itself is inland, but the municipal boundaries include 2 km of Mediterranean coast. The municipal area of Benitachell covers approximately 12 square kilometres, and is made up of two very different types of landscape: in the north-east, rolling terraced promontories given over to farming and in the south the coastal area, very mountainous, with high, sheer cliffs plunging down to sea coves. There are also several residential developments and areas, which have given a significant boost to services and tourism. The coastline of Poble Nou de Benitachell is very dramatic, with spectacular cliffs and viewpoints from where to enjoy the finest sea views on the Costa Blanca. Nestled at the foot of the cliffs there are wonderful beaches and coves: de los Tiestos cove, el Llebeig cove and el Moraig beach. El Moraig beach is ideal for swimming and diving. On el Moraig beach lies the “Cova dels Arcs”, an impressive cave with an underwater route inside. A strategically located municipality close to large towns such as Teulada-Moraira and Javea and only 90 kilometres from the city of Alicante. 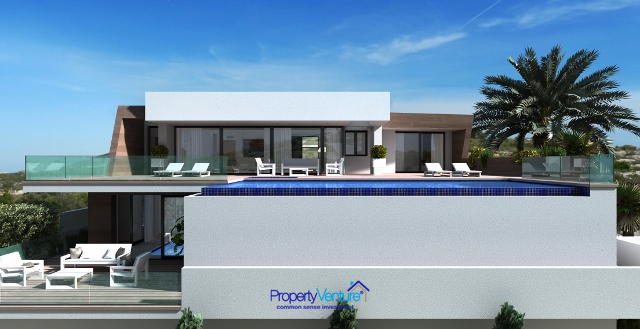 A residential area, within a gated development with exclusive access for residence’s owners. 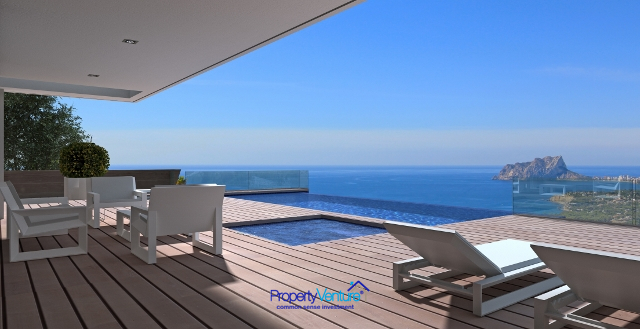 Homes are nestled on plots with stunning sea views, which are maximised from their South, South-West vantage point. There are local services open year-round, like a restaurant, shop, hairdressers. These luxury villas are in an ideal location for those of you wishing to buy a unique home, with a bespoke design, according to your taste and to suit your lifestyle. 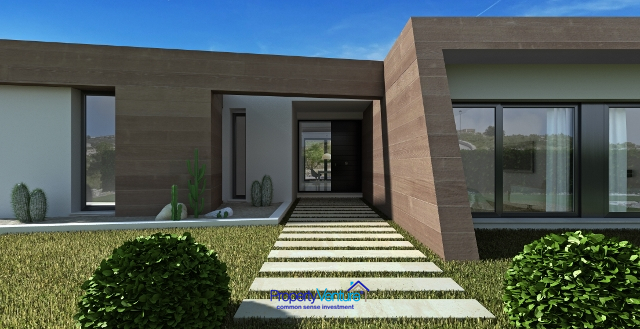 All within an environment where luxury prevails, with a well thought-out infrastructure and landscaping with natural stone walls, wide roads, gardens, designer lighting, security, private access for owners with access control. 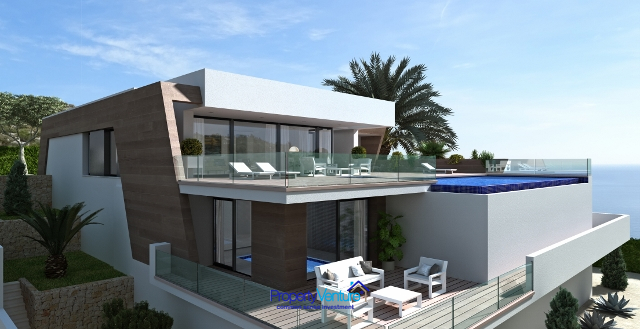 This villa stands out for its exterior design, a combination of clear lines with a modern and elegant style. The villa’s spectacular views across the Mediterranean Sea towards the Ifach Rock, is a major asset. The main living area is situated on one floor, which makes it ideal for those who do not want to use stairs. On this floor there is a spacious entrance hall, three bedrooms with en-suite bathrooms, one of which, the master bedroom, also has a walk-in wardrobe and has direct access to the terrace. The spacious kitchen is connected to the lounge and a sunny terrace, where you can enjoy the fresh air. This leads to the terrace with the infinity pool and a Jacuzzi. The layout of this floor also includes a guest toilet and a laundry room. 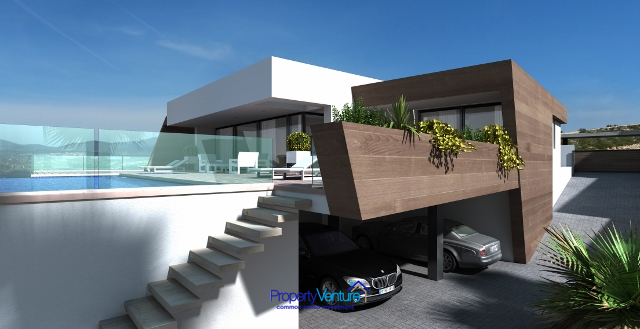 On the lower level lies the large garage with space for 3 vehicles (24.90 m2), with a terrace and a porch covering more than 100 m2. This versatile space can be adapted to your needs, for example it can range from a guest apartment to a leisure and relaxation area, with a home cinema, indoor pool, sauna, a 100% customisable space from which the wonderful views of the Mediterranean Sea can be enjoyed.